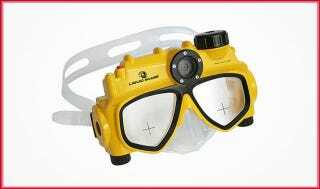 If you're going to go through the hassle of getting SCUBA certified and entering therapy to get over your irrational fear of fish, you might as well spring for this ultra-rad underwater swim mask with integrated waterproof digital camera. Videos of schools of goatfish and stills of anemones can be downloaded via USB directly to your computer to live on in screensaver glory for all of eternity. Click here to find this and other Eye Candy in Gawker's Great Finds Gift Guide, driven by the all-new 2011 Jetta.